Throughout the 20th Century, actors, writers, and directors often brought their personal prejudices to their work, portraying a world of stereotypes: sombreros and serape-draped Mexicans taking siestas on sidewalks; Mexicans consuming only the three diet staples of chile, tacos, and liquor; the Hispanic inevitably seeking political and social guidance, acceptance, and "enlightenment" from Whites. Portrayals were so insulting that for several years Mexico banned American movies due to their negative depictions of Mexicans. As early as 1908, D. W. Griffith's The Thread Of Destiny used the term "greaser" to identify a Mexican bandit. Later silent films took this portrayal and expanded it in such films as Tony the Greaser (1911), The Greaser's Revenge (1914) and Broncho Billy and the Greaser (1914). At a time when revolutionaries were struggling to free Mexico from the Porfirio Diaz dictatorship, Hollywood completely ignored the revolution in Mexico in favor of using Mexican banditos and peons as convenient props for Westerns. With the advent of sound the stereotypes remained, although it did go through some modifications — such as that of the Cisco Kid film series produced during the 1930s and 1940s. Unlike the traditional Mexican bandit, portrayed as foul and greasy, the Cisco Kid was a more refined Californio, a dashing Robin Hood type. 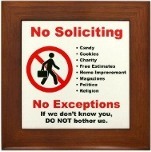 But he was definitely the exception. His sidekick, "Gordito," or "Pancho" in some films, was a weak, bumbling fool. And the Kid often had as adversaries the greasy bandit types from which the Kid had evolved. Another very popular stereotype was Hispanic men as weak peons. Typically the ignorant peon occupied the landscape while the White cowboy was portrayed as heroic and gallant. Mexican peons were usually the nondescript, cowardly audience for a gunfight, a guitarist playing in the background to a romance by the White protagonists, or a target for sharp-shooting cowboys. One wonders how such films as The Magnificent Seven (1960), Viva Maria (1965), The Wild Bunch (1969), Butch Cassidy and the Sundance Kid (1969), Two Mules For Sister Sara (1970), and countless spaghetti westerns, could have been made without the prop of complacent, weak, and illiterate peons whom the heroes could variously rescue, defend, organize, or slaughter -- depending on the plot. Hollywood films have produced equally denigrating portrayals of Mexican and Chicana women. One example is the series of films about the "Mexican Spitfire," films with titles like Hot Pepper (1933), Strictly Dynamite (1934), The Girl From Mexico (1939), and Mexican Spitfire (1939). A variant of the Mexican spitfire was Estelita Rodriguez's portrayal of the "Cuban fireball," in such films as Cuban Fireball (1951), Havana Rose (1951), The Fabulous Senorita (1952), and Tropical Heatwave (1952). And another variant was the popular image of Carmen Miranda as a saucy, exotic dancer with fruit-laden hat and fiery temper in films like That Night in Rio (1941) and Copacabana (1947). Again, the message was the same: the Latin woman represents a hot-blooded temptress obsessed with carnal pleasure. Rita Hayworth was born Margarita Cansino and was renamed by Columbia Pictures to downplay her Spanish roots-- a practice common for any ethnic actor. But her difficulties in finding work were obviously more easily overcome than those of her Latino peers. Looking back at what should’ve been choice roles for Latinos reveals a parade of Brownface minstrelsy. Marlon Brando as Zapata, Telly Savalas as Pancho Villa, Warren Baxter as the Robin Hood of El Dorado, Charlton Heston as a Mexican copper in Touch of Evil and Lou Diamond Phillips in just about everything he does. With the emergence of situation comedies, westerns and cops and robbers programming on television, stereotypic renderings of Latino types were borrowed from motion pictures and incorporated into a variety of television programs. 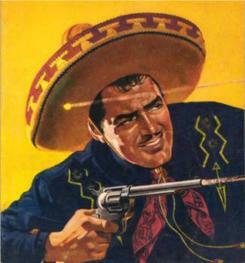 For example, the comic Mexican buffoon stereotype portrayed early on by Chris Pin Martin as "Pancho" in the Cisco Kid film series, evolved into such characterizations as "Pepino" in The Real McCoys television series; Sgt. Garcia in the Zorro series; and "Chico" in the Chico and the Man television series. 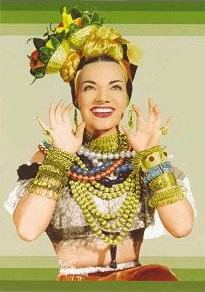 In similar fashion other Latino stereotypes were brought into television. The Mexican bandit and docile peon became familiar parts of the Southwestern U.S. landscape in television series such as WYATT EARP, CHEYENNE, GUNSMOKE, THE RIFLEMAN, or WANTED: DEAD OR ALIVE. The Latino criminal emerged in his own right as perhaps the single most common type of Latino in police series such as IRONSIDE, POLICE STORY, KOJACK, STARSKY AND HUTCH, MOD SQUAD and others. 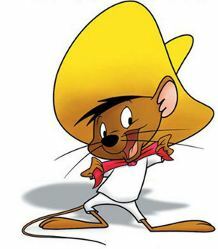 Speedy Gonzalez was one of the few Latino characters children were exposed to on television throughout the 50s, 60s, and 70s and he was the equivalent of the Mexican Sambo. His overactive libido, huge sombrero and thick accent came to represent Mexico for generations of Americans. His cousin and sidekick, the lazy, drunken Slowpoke Rodriguez was even more offensive. Perhaps the most blatant example of racial stereotyping involves Black Hispanics. Despite the fact that 18% of the population of Latin America is of African descent (compared to 12% for the United States), appearances or roles for Hispanics of African descent have been virtually non-existent on U.S. television. Black Latinos also complicate the casting for marketing campaigns and programming directed at Hispanics. Most surprising is the fact that Afro-Latinos are conspicuously absent from most Spanish-language TV programming in the U.S. 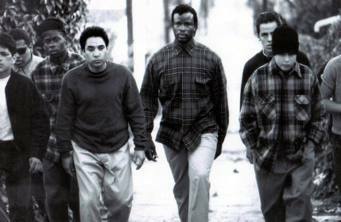 Even though Hollywood filmmakers stopped the practice of using Whites to portray Blacks and Asians on screen long ago, Whites have continued to portray Chicanos and Hispanics into the contemporary era. And White Hispanics are the preferred as sophisticated Latinos, whereas the non-white or mixed Latinos are generally relegated to supporting roles as drug mules, banditos and gang-bangers.